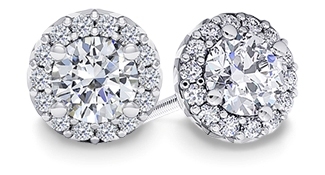 Enter to win a pair of Halo Diamond Earrings featuring two excellent cut loose diamonds encircled by pave set round-brilliant diamonds in 18 karat white gold. It has a 1/2 carat total diamond weight with a retail value of over $2,300. The contest will run from December 01, 2011 at 12:00 PM EST and ends on January 01, 2012 at 12:00 EST.